Mix sugar and cornstarch in a 1 ½ quart saucepan. Stir in water gradually. Cook over medium heat, stirring constantly, until mixture thickens and boils. Boil and stir 1 minute. Gradually stir in egg yolks. Boil and stir 1 minute. Remove from heat; stir in butter, lemon peel, and lemon juice. Let set while you prepare the meringue. Beat egg whites, vanilla, and cream of tartar until foamy. Beat in sugar, 1 tablespoon at a time; continue beating until stiff and glossy. Don’t under beat. 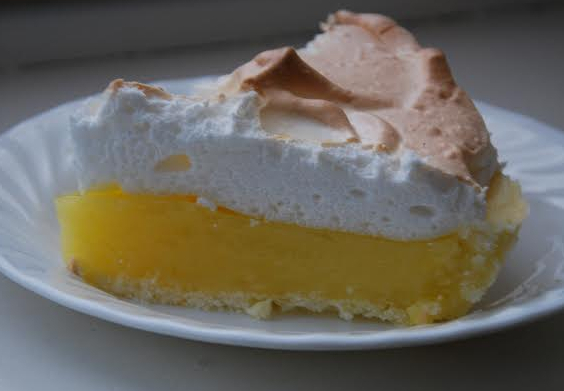 Pour lemon filling into pie shell. Spoon meringue onto hot pie filling; spread over filling, carefully sealing meringue to edge of crust to prevent shrinking or weeping. Bake in 400 degree oven until delicate brown, about 10 minutes.